Stockwell Elastomerics inventories a wide cross section of acrylic and silicone pressure sensitive adhesives (PSAs). A unique, specialty adhesive, 3M 9731 combines both adhesive families. This double coated adhesive (also called film supported adhesive) uses .0016″ thick premium acrylic (350 series) adhesive on one side of a .001″ PET film and .0029″ thick silicone adhesive on the opposite side of the PET. The total adhesive thickness is .0055″ thick without release liners. The most common use for this adhesive is for laminating to silicone rubber materials. 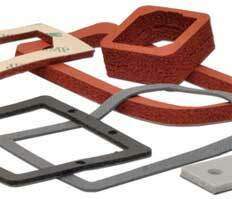 The silicone side of this combination adhesive cross-links with the silicone rubber materials. It is important to note that 9731 bonds better to some silicone materials than others. Also, the amount time to cross-link – to get a strong bond – may vary. While 3M 9731 utilizes a silicone adhesive, which typically exhibit very high temperature properties, the entire adhesive construction limits the usage temperature. The acrylic and PET layers reduces the long term operating temperature to 250°F (121°C). This is important since silicone rubber is often specified for its high operating temperature. If high and low operating temperatures are need, a silicone PSA can be specified. The acrylic side of 9731 is often the adhesive exposed by the end user. This is a very good 3M 350 series adhesive that will generally bond very well to wide range of materials (metals, plastics, etc.). Adhesion to stainless steel is approximately 93 oz/in (90 degree peel). 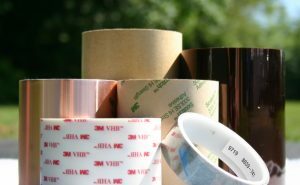 The cost of 3M 9731 is in line with specialty adhesives and is relatively expensive. In many cases 9731 cost more than the silicone rubber that it is bonded to. If cost is a concern, Stockwell Elastomerics recommends 3M 9485 (or 3M 9675) as a 3M 9731 alternative. 9485 uses the same premium 350 series adhesive used in 9731 but is a fraction of the cost. Stockwell Elastomerics uses proprietary technology enabling acrylic PSAs to bond to silicone rubber. For more information about 3M 9731, 3M 9485 or other adhesive options for gasketing and cushioning pads, please call Stockwell Elastomerics at 215-335-3005 or complete a contact form for assistance. You list the most common uses for this type of adhesive but I was wondering about other applications that it is used in and how wide of an area it covers. Not looking for anything specific, just curious overall. Thanks for posting the information though. Looking forward to a reply! Which side has silicone adhesive, the one with Plastic Liner ( Clear ) Or the one with Tan/Brown paper? Silicone adhesives require specially treated liners, these fluoropolymer liners often contribute to the higher cost. In the case of 3M 9731, the silicone adhesive is on the plastic liner side, the 350 series acrylic adhesive has the kraft paper liner.